-The new range of Triblade hand blenders are faster, stronger and even easier to use than ever before. -Performance improvements and brand new attachments will help you blend, mash and chop your way to the perfect meal, quickly and effortlessly. -Our unique Triblade system is a truly innovative design that combines 3 elements to give you unrivalled performance: angled blades blend more of your food in less time, specially designed ribs reduce suction and the unique foot shape stops splashing, keeping you and your kitchen clean. -An improved motor makes the new range of Triblade 14% more powerful than ever before and able to handle 20% heavier loads – right down to the toughest foods such as frozen fruit and root vegetables. -Changes to the shape of the handle make the Triblade hand blender even more comfortable to use and the Suregrip material won’t slip even in wet or greasy hands. -Smoother speed control gives you complete power over your food. -Simply slide the easy to use dial from minimum to maximum speed and blend your food to the perfect consistency every time with no mistakes. -A wide range of attachments mean that your Triblade hand blender can do so much more than just blend. -Create the perfect creamy mash or soups with the MasherPro (available in metal or plastic) and Soup XL attachments, chop herbs for cooking or salsa for dipping in seconds with the chopper attachment or whisk up egg whites and batters in the specially designed beaker with the balloon whisk attachment. 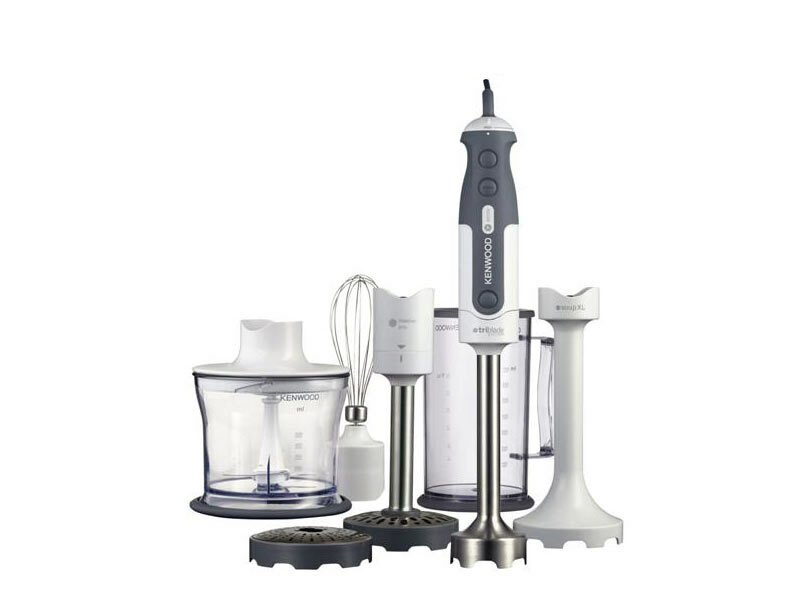 -The HDP408WH Triblade hand blender comes complete with soup XL, metal masher , metal balloon whisk, 0.5 litre chopper and 0.75 litre beaker attachments and features a metal wand and variable speed control.